Inside of my Caravan are creatures of every shape and size.... have your tickets ready! MORRISBURG - Among the period costumes and kind smiles of Upper Canada Village, a different darker sort of history lesson unfolded. 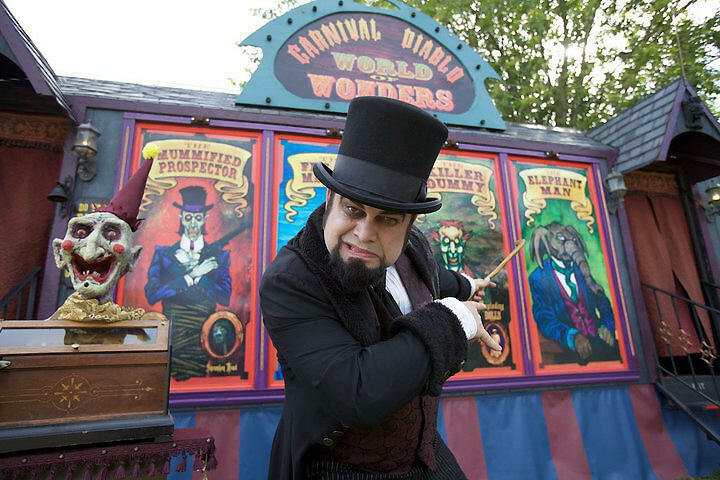 With piercing eyes and a devilish grin, Nikolai Diablo greeted guests as they peered behind the curtain of his World of Wonders, an old-style freakshow that made hearts race in the already grueling heat. 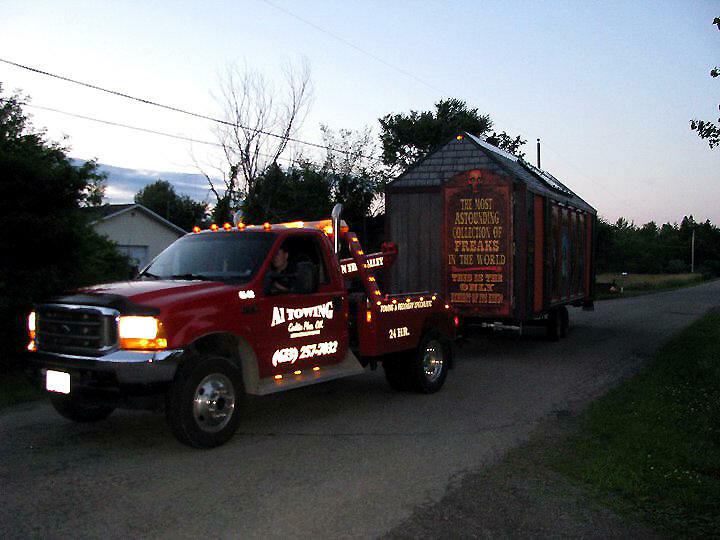 Diablo said his grandfather owned Canada's only touring Vaudeville Sideshow from 1920 through 1968. 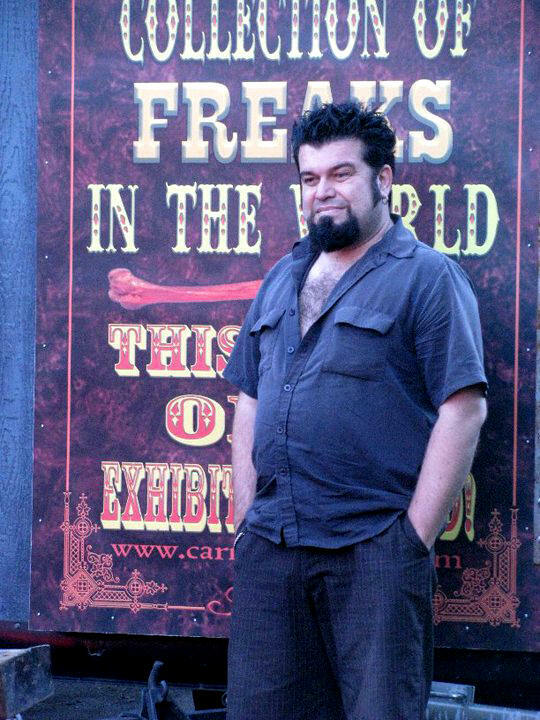 "I spent the first 15 years of my career performing an old time vaudeville medicine show and at 27 decided to emulate the astounding sideshow feats he had used in his show," Diablo explains. 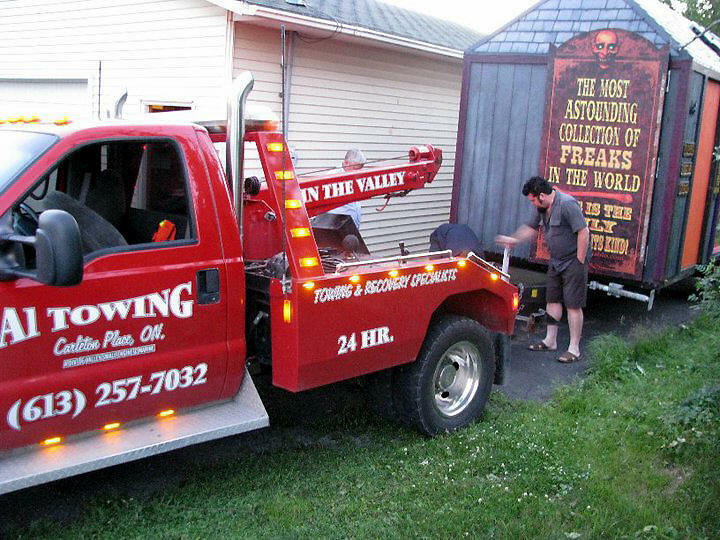 Diablo smiled as he watched a young woman walk up the ramp to the dark trailer filled with speakers that piped in spooky music. "Say goodbye to your friend." Diablo said with an evil laugh. "You may never see her again." 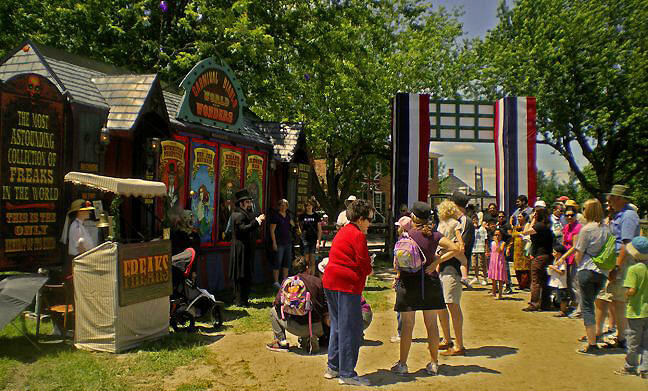 Crowd gathered in anticipation to see Carnival Diablo's World of Wonders at Upper Canada Village 2010. Eventually the woman returned, though a little shaken. "That was terrifying," said visitor Mary Ott. "I couldn't stand to look into the dummy's eyes." The ventriloquist's dummy that scared Ott was created in 1923. Inside the freakshow trailer, it was chained down to a crate as a protective measure. 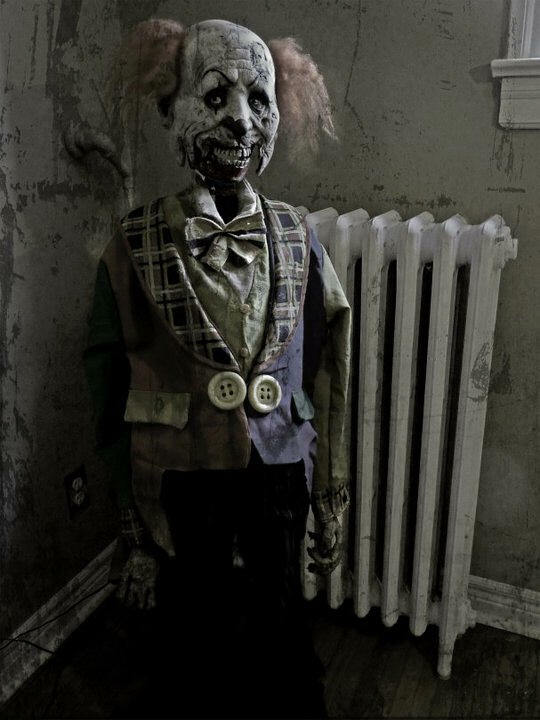 According to its descriptive plaque, the doll was originally designed to bring on "mirth and laughter" by its owner Larry Tomay, a ventriloquist entertainer. As legend has it, Tomay was found dead in his dressing room on the night of his opening performance with the creepy dummy. Police allegedly found the dressing room door locked. When they eventually got inside, Tomay was found brutally beaten to death. "The marks on his body were the size of a child's fists," the description stated. In his will, Tomay has left the dummy to his sister. She was to be married that year, but her and her fiance died in a freak fire just tow weeks before they were to be wed. The dummy was reported to be one of the only intact items acquired from the fire. 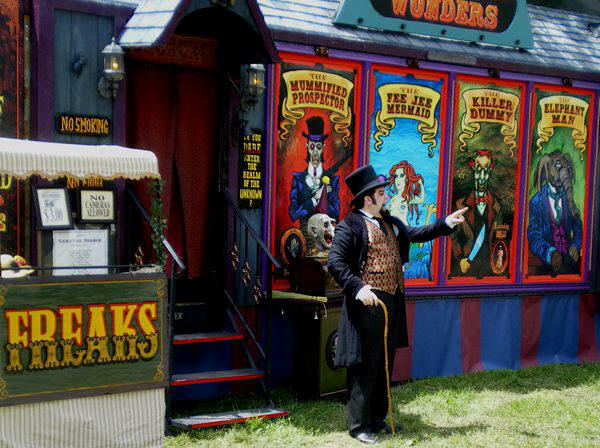 Among the other items in Diablo's freakshow were voodoo dolls, an albino skunk and a mutant pig from Illinois in 1873. The preserved pig has three eyes and two snouts. Diablo's show also offered one of the only known life-size models of the legendary "Elephant Man," also known as Joseph Merrick, who suffered from neurofibromatosis or possibly Proteus syndrome. Merrick's bizarre physical deformities set him on the European freakshow circuit during the 1880's. He died at 21, but his story lives in film and Diablo's travelling sideshow. photographs were not allowed inside the trailer. 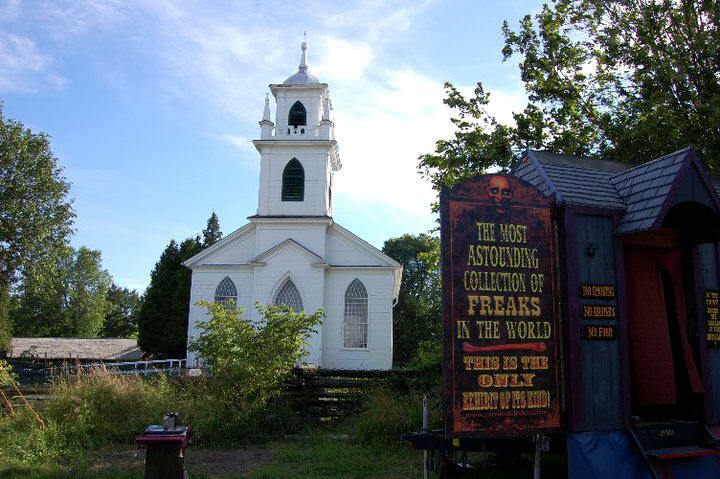 Come on out and visit the oldest Traveling Freakshow in Canada! 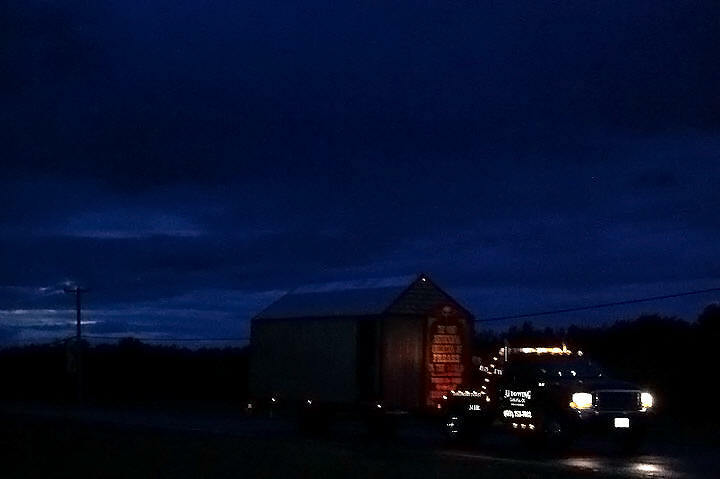 World of Wonders being set up at Upper Canada Village... and lurking behind us was the towns Church. 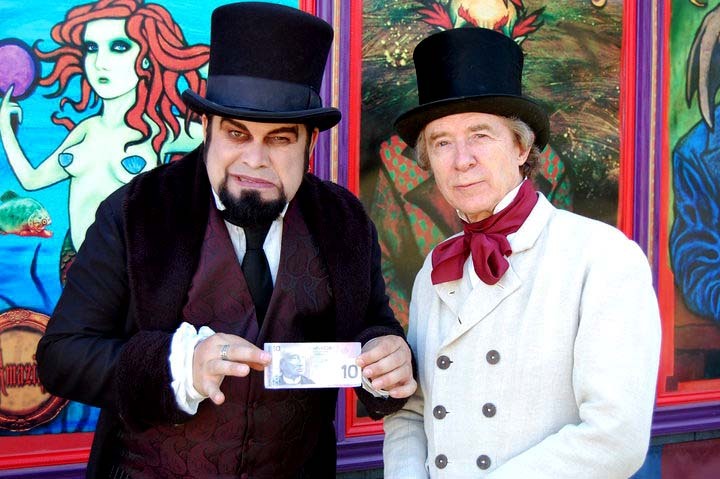 Nikolai Diablo with Sir John A Macdonald... and a crisp $10 bill with his picture on it. I stuffed him into my pocket right after the pic was taken and then put the $10 bill in my wallet. 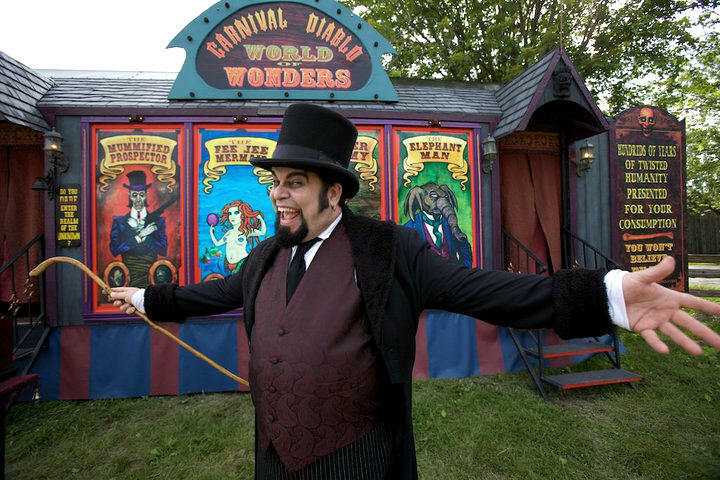 Welcome to Carnival Diablo's World of Wonder's! Introducing Herb Gacey...He's ready for work at the Carnival.